A healthy debate appears to be developing in the run up to the 2016 elections, with politicians of all parties raising the issue of stagnant wages. 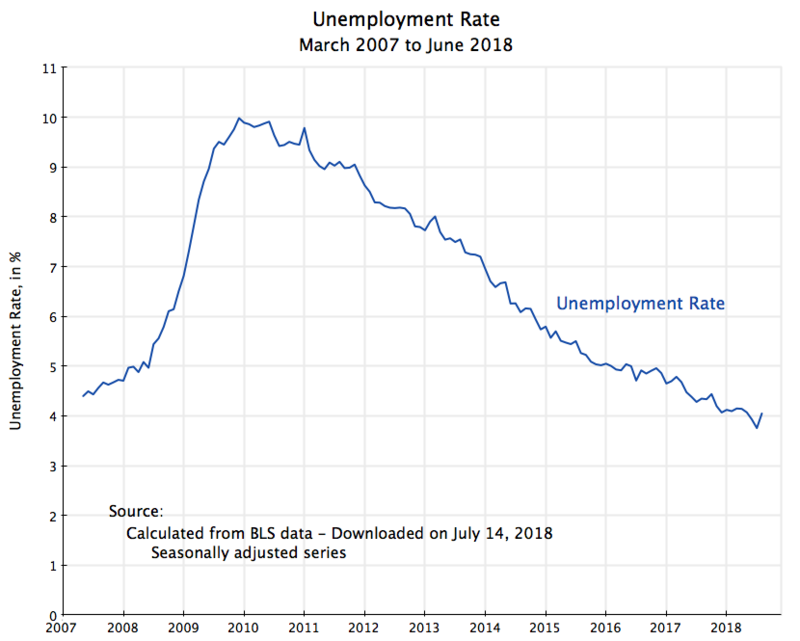 Republicans have charged that this is a recent development, and the fault of Obama, but that is certainly not the case. 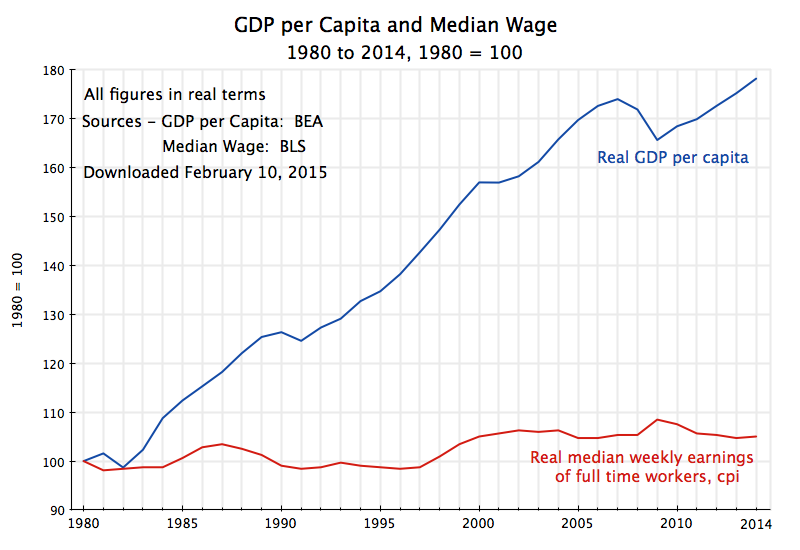 As the diagram above shows, real median wages have been stagnant since at least 1980, despite real GDP per capita which is 78% higher now than then. Real median wages are only 5% higher (and in fact unchanged from 1979). 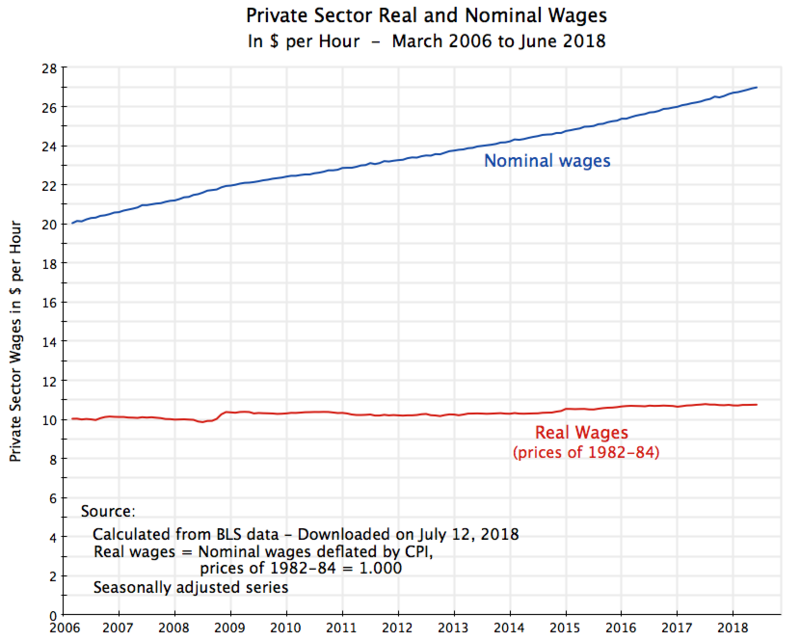 In a normally developing economy, one would expect real GDP per capita and real wages to move together, growing at similar rates and certainly not diverging. But that has not been the case in the US since at least the early 1980s. Why has such a large wedge opened up between worker earnings and GDP per capita? This blog post will look at the immediate factors that lead from one curve to the other. This will all be data and arithmetic, but will allow one to decompose the separation into several key underlying factors. A future blog post will look at policies that would address those factors. The chart here goes back further, to 1947, to show the divergence in recent decades in a longer term perspective. 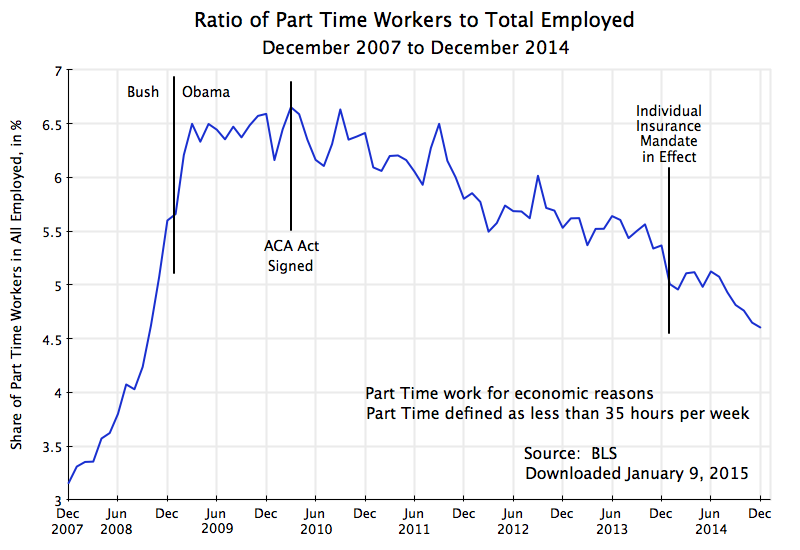 The data come from the Bureau of Economic Analysis (BEA) or the Bureau of Labor Statistics (BLS). As one sees, the curves moved together until around the mid-1970s, after which they began to diverge. Starting at the top, real GDP per capita (the curve in blue) measures the progression, in real terms, of GDP per person in the US. GDP captures the value of all goods and services produced in the economy. Its price index, the GDP deflator, is a price index for all those goods and services. Although there have been temporary dips with periodic recessions, real GDP per capita has in fact grown at a remarkably stable long term rate of about 1.9% per annum going back all the way to 1870. The growth rate was in fact a bit higher, at 2.0%, from 1947 to 2014, as the 1947 starting point was somewhat below the long term trend. With this growth, real GDP per person was 3.75 times higher in 2014 than what it was in 1947. But wages are paid to individual workers, and the share of workers in the population can change over time. The share has in fact grown significantly over the post-war period, and in particular since about the mid-1960s, principally due to women entering the labor force. There will also be demographic effects leading to changes in the shares of the very young and of retirees. With a growing share of the population in the labor force, real GDP per full time equivalent (FTE) worker (the measure of the labor force used by the BEA) will grow by less than it will per person in the population. The path of real GDP per FTE worker (the curve in green in the chart above), will rise more slowly than the path for real GDP per capita. The curves start to diverge in the mid-1960s, when large numbers of women began to enter the labor force. It should also be noted that the divergence in the two paths will not necessarily continue forever. Indeed, the paths have in fact grown broadly in parallel from around 1997 until 2008 (when GDP per capita dipped in the downturn that began in the last year of the Bush administration). The number of women entering the labor force reached a peak as a share of the labor force around 1997, and a decade later the first of the baby boomers started to retire. Thus while such demographic factors and labor force participation decisions led to a significant divergence in the two paths (between GDP per capita and GDP per FTE worker) from the mid-1960s to the late-1990s, the impact since then has been broadly neutral, and might in fact go the other way going forward. Next, workers are paid wages, not units of GDP. Wages and salaries made up roughly half of GDP in 1947, with most of the rest accounted for by profits to capital. And it stayed in the narrow range of 49 to 51% of GDP continuously until 1974. 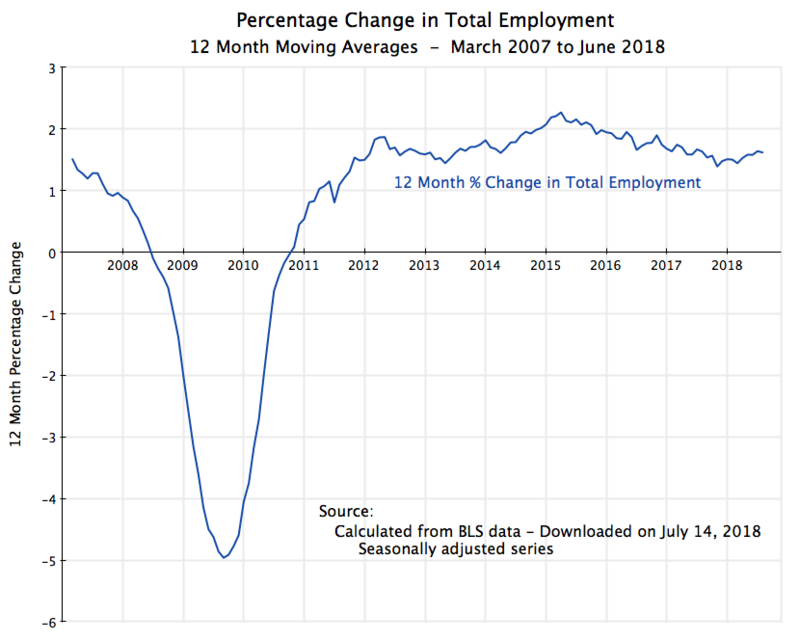 The share then fell to 48%, where it held until 1981, and then began to deteriorate much more sharply, to just 42% as of 2013 (the most recent year with this data). If the share of wages in GDP had remained constant, then the growth of wages per FTE worker would have exactly matched the growth of GDP per FTE worker. But with a declining share of wages in GDP (with a growing share of profits as the mirror image), the curve (shown in brown in the chart above) of wages per FTE worker will rise by less than the curve of real GDP per FTE worker. The curves so far have been measured in real terms based on the GDP deflator. The GDP deflator is a price index that takes into account all goods and services produced in the economy, and the weights in the price index will be in accordance with the shares of each of the goods or services in the overall economy. But to an individual, what matters is the prices of goods and services that he or she buys. This is measured by the consumer price index (cpi), where the weights used are in accordance with the expenditures shares of households on each of the items. These weights can be significantly different than the weights of the items in GDP, as GDP includes more than simply what households consume. The curve in orange in the chart above is then the average real wage but with the cpi rather than the GDP deflator used to account for inflation. From 1978 onwards, the average real wage based on the cpi grew by significantly less than the average real wage measured in terms of the GDP deflator. That is, inflation as measured by the items that make up the cpi grew at a faster rate, from 1978 onwards, than inflation as measured by the items (and their weights) that go into the GDP deflator. Up until 1978, the cpi and the GDP deflator grew at remarkably similar rates, so the two curves (brown and orange in the chart) follow each other closely up to that year. What happened after 1978? 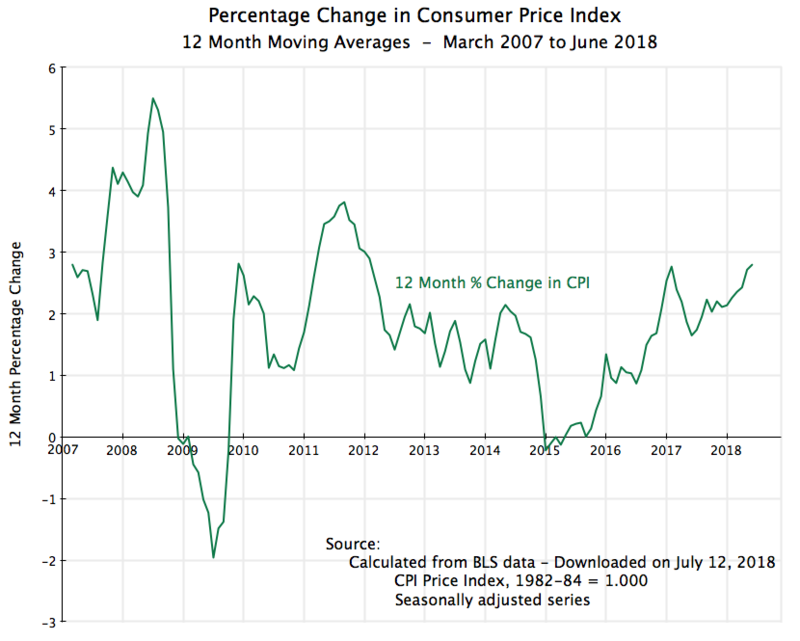 The prices of several items whose weight in the cpi is greater than their weight in the GDP deflator began to rise more rapidly than other prices. Especially important was the rise in medical costs in recent decades, but also important was the rise in housing costs as well as energy (with energy increases already from 1974). Thus wages expressed in terms of what households buy (the cpi) rose by less, from 1978 onwards, than when expressed in terms of what the economy produces overall (the GDP deflator). The final step is to note that average wages can be misleading when the distribution of wages becomes more skewed. If the wages of a few relatively well off wage earners (lawyers, say) rise sharply, the average wage can go up even though the median wage (the wage at which 50% of the workers are earning more and 50% are earning less) has been flat. And that median wage is what is shown as the red curve in the chart. Since 1980 (and indeed since 1979, when the series starts), the median real wage has been flat. This is not a new phenomenon, that only began recently. But it is a problem nonetheless, and more so because it has persisted over decades. Aside from demographic effects (including the impact of women entering the labor force), and the differential impact of certain price increases (medical costs, as well as others), the reason median real wages have been flat since around 1980 despite an increase of real GDP per capita of close to 80% over this period, is distributional. The share of wages in GDP has been reduced while the share of profits has increased, and the distribution within wages has favored the better off compared to the less well off (leading to a rise in the average wage even though the median wage has been flat). That is, the US has a distribution problem. Wages have lost relative to profits (and profits largely accrue to the rich and wealthy), and the wages of lower paid workers have fallen even while the wages of higher paid workers have risen. This is an update of a chart presented in an earlier post, with data now available through 2012, and with the period from 1945 to 1980 included on the same chart as well. 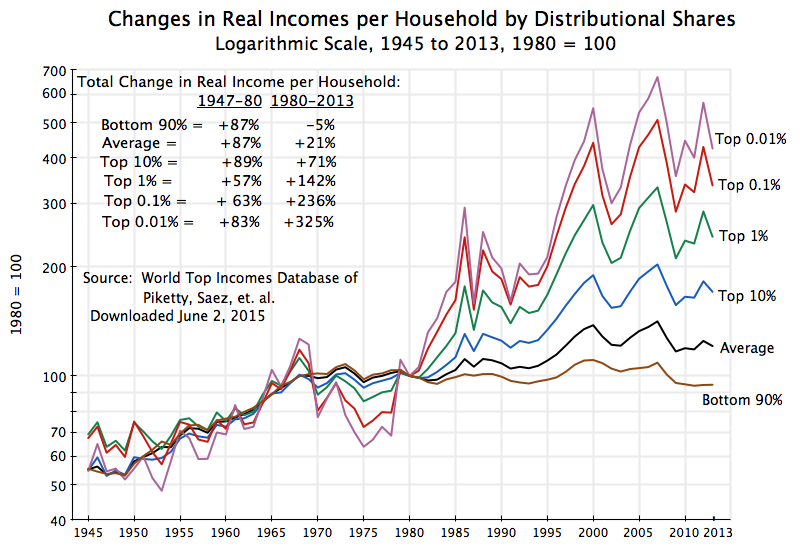 The data comes from the World Top Incomes Database, which is maintained by Thomas Piketty, Emmanuel Saez, and others. The data is drawn from individual income tax return filings, and thus the distribution is formally by tax reporting unit (which will normally be households). The incomes reported are total taxable incomes, whether from wages or from capital. Over the 33 years from 1947 to 1980, average reported taxable incomes rose in real terms (using the cpi price index to adjust for inflation) by 87%. The incomes of the bottom 90%, the top 10%, and the top 0.01%, rose by almost exactly the same amount, while the incomes of the top 1% and top 0.1% also rose substantially (by 57% and 63% respectively). It is amazing how close together all these figures are. This changed dramatically from 1980. As the chart above shows, the curves then started to diverge sharply. Furthermore, the average reported income rose only by 24% over 1980 to 2012, even though real GDP per capita rose by 73% over this period. 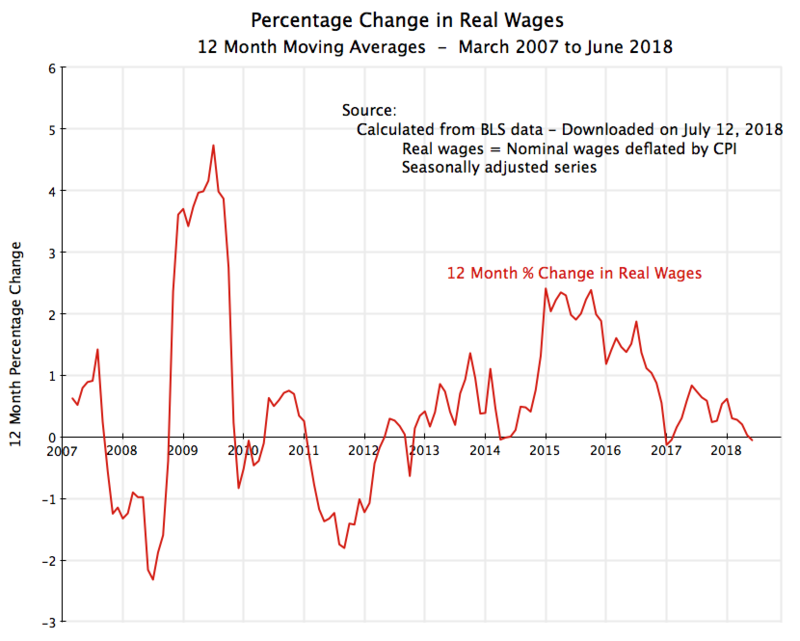 The 24% average increase can be compared to the 28% increase over the same years in the average real wage (based on the cpi). While from two totally different sources of data (income tax returns vs. the national income accounts of the BEA) and measuring somewhat different concepts, these are surprisingly close. 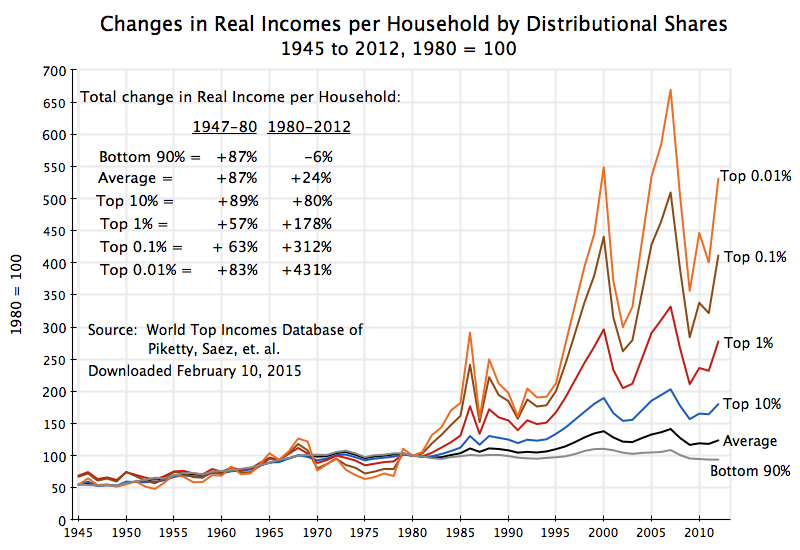 But while average real incomes per household rose by 24%, the bottom 90% saw their real incomes fall by 6%. Instead, the rich gained tremendously: by 80% for the top 10%, by 178% for the top 1%, by 312% for the top 0.1%, and by an astounding 431% for the top 0.01%. The US really does have a distribution problem, and this deterioration in distribution largely explains why real median wages have stagnated since 1980, while real GDP per capita grew at a similar rate to what it had before. To summarize, in the post-war period from 1947 to about the mid-1970s, measures of real income per person grew substantially and at similar rates. Since then, real GDP per capita continued to grow at about the same pace as it had before, but others fell back. 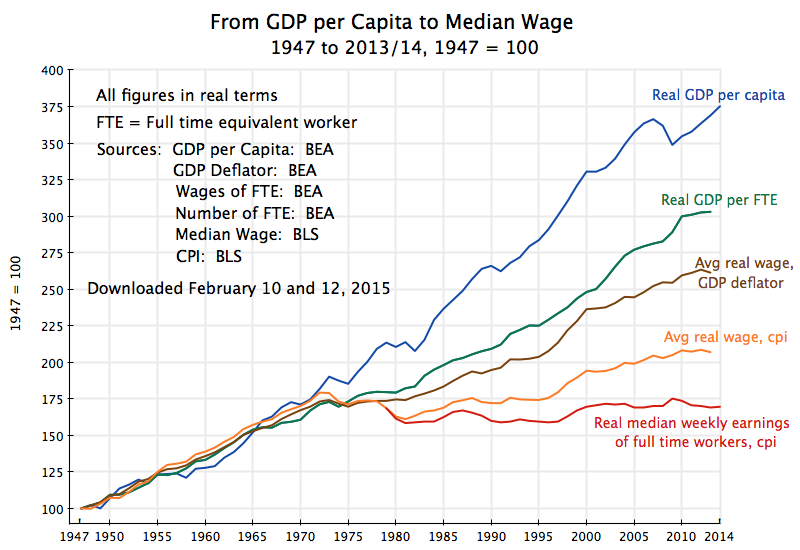 The median real wage has been stagnant. a) Real GDP per worker has grown by less than real GDP per capita, as the share of those working the population (primarily women) has grown, with this becoming important from around the mid-1960s. However, there has been no further impact from this since around 1997 (i.e. the curves then moved in parallel). It may be close to neutral going forward, but was an important factor in explaining the divergence in the period from the mid-1960s to the late-1990s. b) The average real wage (in terms of the GDP deflator) has grown by less than real GDP per worker, as the share of GDP going to wages has gone down while the share going to profits (the mirror image) has gone up, especially since about 1982.
c) The average real wage measured in terms of the cpi has grown by less than the average real wage measured in terms of the GDP deflator, because of the rising relative price since 1978 of items important in the household consumption basket, including in particular medical costs, but also housing and energy. d) The median real wage has grown by less than the average real wage (and indeed has not grown at all since the data series began in 1979), because of increasing dispersion in wage earnings between the relatively highly paid and the rest. 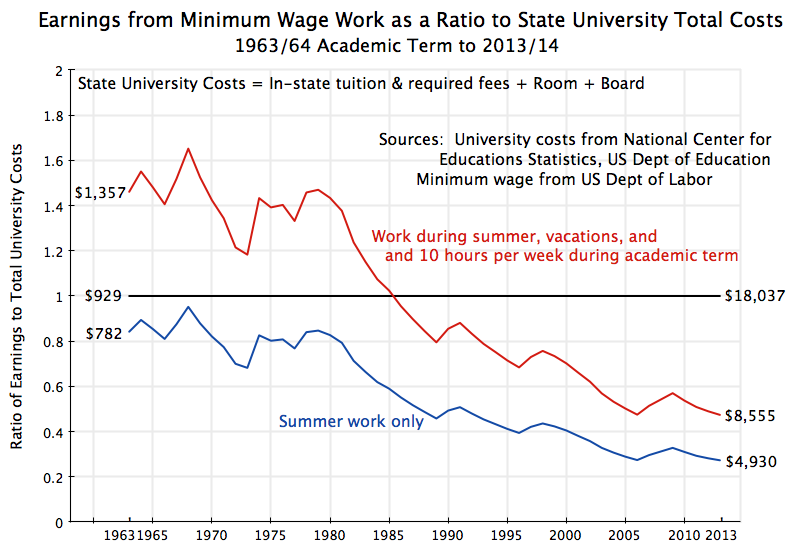 The implication of all this is that if one wants to attack the problem of stagnant wages, one needs to address the sharp deterioration in distribution that has been observed since 1980, and secondly address issues like medical costs. Medical costs have in fact stabilized under Obama, as was discussed in a recent post on this blog. But while several of the measures passed as part of the Affordable Care Act (aka ObamaCare) have served to hold down costs, it is too early to say that the previous relentless upward pressure of medical costs has ended. More needs to be done. 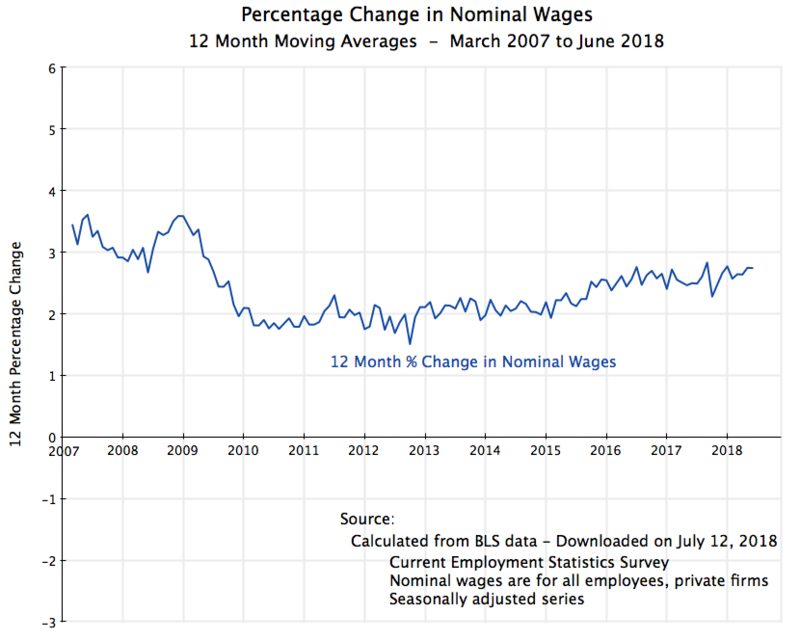 Future blog posts will discuss what policy measures could be taken to address the problem of stagnant real wages and the deterioration in the distribution of income, as well as what can be done to address medical costs.